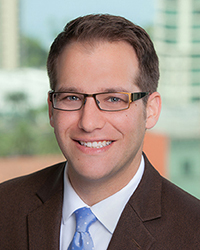 Sean Karafin joined the San Diego Regional Chamber of Commerce staff in 2015 and as vice president of public policy and economic research oversees day-to-day activity of the public policy department and economic research efforts while managing the policy positions and agendas for the chamber’s various policy committees. The San Diego native has served and currently serves on multiple boards and committees including the Regional Taskforce on the Homeless Board, the City of San Diego’s Sustainable Energy Advisory Board, the Water Reliability Coalition, the Circulate San Diego Policy Committee, the United Way Policy Committee, and the North Park Community Association Board among others, according to the chamber’s website. Before joining the chamber, Karafin served in multiple roles at the San Diego County Taxpayers Association including as interim president and CEO from March through June 2014. Before entering the nonprofit sector, Karafin held positions at two economic consulting firms: Applied Development Economics in the San Francisco Bay Area and BW Research Partnership in North County. Karafin earned a bachelor’s degree in economics from San Diego State University and a master’s degree in economics from UC Santa Barbara. His keynote talk will address trends to look for in the San Diego economy in 2019. Kevin Dusi is a partner at Moss Adams LLP, where he serves a variety of clients ranging from closely held businesses to large, public, multinational corporations. He focuses primarily on the technology and life science sector as well as the manufacturing and distribution industry. Dusi is the San Diego office tax leader and is part of Moss Adams’ International Tax Services Group. This continues to be a hot topic into 2019 as a lot of the rules and regulations have not yet been finalized or in some cases even written. With individuals, companies and their accountants having spent a lot of 2018 dealing with the more immediate impacts of tax reform (e.g. fixed asset expensing and mandatory repatriation of offshore earnings), many are now trying to understand the areas that most impact either their business or their individual tax situation. 20 Percent Deduction on Pass-Through Income: One of the main tax benefits given to individuals in an attempt to reduce rates closer to the now 21 percent corporate rate was the 20 percent deduction on qualifying pass-through income. There are finally proposed regulations in this area, and for San Diegans this looks to be a significant benefit, bringing the maximum tax rate on qualifying income down to 29.6 percent (from 37 percent). Tax Reform Aims to Keep IP in the U.S.